Finding Wonderland: The WritingYA Weblog (archive): Toon Thursday: We're Back, We're Bad. Finally, after a long hiatus, Toon Thursday is back. Hope you enjoy. Click the cartoon to view it larger. 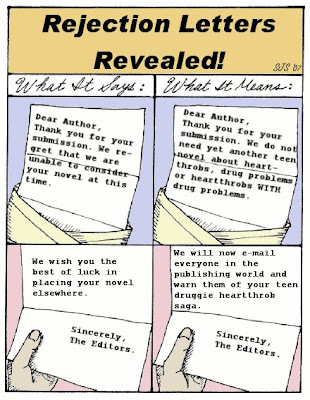 The pictorial version of The Publishing Whisperer: Decoding A Rejection Letter... but better. Hoo-wee. These are a writer's inner nightmares, for sure. So glad the toons are back!